We have very informative and reassuring reviews. Most of the comments from past renters are very positive. Find your property below and see for yourself. Ann was great to work with from the moment we called about the property until the time we left. She was kind and very prompt to answer the phone/ respond if needed. She is a wonderful property manager that we actually were able to meet in person! She was wonderful!! High praises. This condo is beautifully decorated, with all of the amenities, and is the epitome of relaxation!! My daughter and I came for a spring getaway and could not have been more pleased with Sugar Shack/ Sugar Dunes #20. The description of the property is spot on and we felt like the place was even better than the photos on the site! It is on the 3rd floor with elevator access on a beautiful private beach. There are 2 beach chairs and umbrella marked with your condo number that are set up each morning before 8 am and stay until the evening. Each morning we watched the dolphins from our private porch while we sipped on coffee and relaxed in the ocean breeze. There are many restaurants, grocery stores and shopping nearby. Anything at all you want to do is available. This is a quiet and very relaxing beach, but if you would like more activity Seaside is less than 10 minutes away. We only had one very minor issue that I only mention because they were so prompt in answering the phone and coming by to fix! We noticed the lock on the porch leading to the private beach from our porch was stuck, and that was corrected within the hour. It was no problem because you can access the beach other ways, but it was more convenient to use the porch. 2 brand new smart TV's were added during our stay as well. We hope to come back and stay sometime in the future! You are sure to have an amazing vacation in this home. THE BEST. Working with your team was awesome. Everyone was so helpful. From making reservations, answering questions and even check in was so simple. Thank you for that experience. It was a spring break spent with wonderful friends, at a wonderful location, making wonderful memories!!! Ann was fantastic to work with! She promptly found us a rental and made sure we had everything we needed while there! Our time at Family Tides was wonderful! Our property was beautiful, well stocked and very clean!! 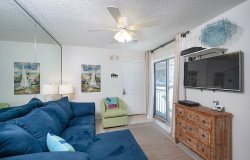 This unit was perfect for our family and just what we needed to enjoy a few days at the beach! This is a beautiful and spacious property. Its location is perfecteasy to get to, close to many favorite restaurants and shops, and yet secluded enough to be so relaxing. Gorgeous beach views right on the sand and surf! Thank you Myers Properties! Any requests were immediately handled! Working with the Myers team was very easy, pleasant and efficient. Our trip and stay at Wonderfall Cottage was a great experience for our family! We will definitely come back again to the Highlands and plan to stay at Wonderfall Cottage. Great experience! Great location and nicely kept accommodations. Loved everything about it! Especially being able to listen to the ocean in the evening once the kids were in bed! Easy access to beach and pool. Very nice interiors, but also kid friendly. For instance the couch is a beautiful sectional, but it is also comfortable too. We also love how close it is to Rosemary Beach. Love this area in the Fall! Beautiful place with great view. We loved the wrap-around porch & ability to hear & see waves from our rooms!